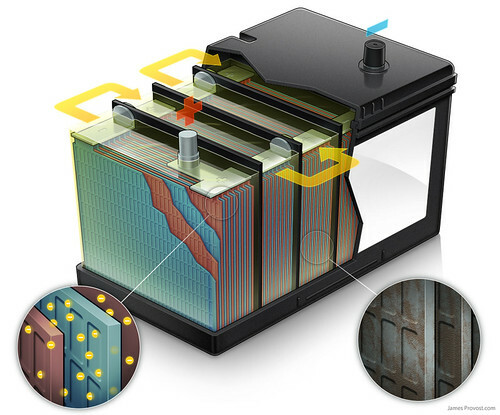 Technical illustration showing how a conventional automotive battery works. Electrons in the positive plates (red) race through an electrolytic solution of water and sulfuric acid into the negative plates (blue). The six cells produce a total of 12.6 volts, powering the ignition system and starting the engine. In older batteries, lead sulfate crystals hinder the flow of electrons. AAA Living, September 2010.